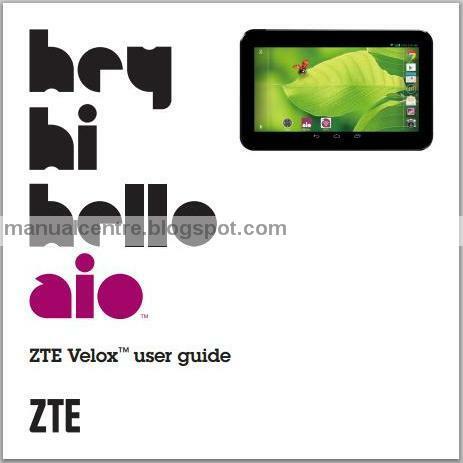 The ZTE Velox Manual aka ZTE V72A tablet User Guide is available in pdf format. For owner you can download at zteusa.com. ZTE Velox comes with 7 inches, LCD TFT with 3 MP camera. It's also available 1 MP front facing camera. This tablet is powered by 1.2GHz Dual-Core Qualcomm MSM8225 Processor with 1GB of RAM and 4GB of ROM. The tablet support for external memory upt 32 GB (MicroSD). The ZTE Velox V72A work on under GSM/EGSM network with frequency of 850/900/1800/1900 and WCDMA network with frequency of 850/1900/2100. The connectivity consist of Bluetooth 4.0, Wi-Fi 802.11 b/g/n, USB and GPS. The ZTE Velox User Manual available in engllish and spanish language. It consist of 124 pages with file size of 5.29 MB. In the manual contains reference information such as tablet part overview, key functions, tutorial Installing the SIM card, microSD™ card, and battery, Locking/unlocking the screen and keys, Using the touch screen, Powering on/off and how to Charging the battery. Then in the ZTE Velox V72A user guide also dicuss about how to Changing the system language, Setting the date and time, Protecting your tablet with screen locks and encryption, Connecting to mobile networks, Connecting to Wi-Fi and bluetooth, Connecting to virtual private networks, Importing, exporting, and sharing contacts, Configuring account sync, Setting up your email account,Changing message settings, using Google talk, GMail, Google+, Using the browser, Changing browser settings, using Maps, using Google search, usng camera and recording video, Playing your music, phone settings, Upgrade the tablet software, safety and troublshooting guide.